LONDON -- Thousands of people, some seen clinging to rooftops and tree branches, still await rescue from rising floodwaters in Mozambique, one week after an intense tropical cyclone walloped the southeast African nation. Some 100,000 people may need to be rescued from the town of Buzi alone, according to a spokesman for Mozambique's Ministry of Land, Environment and Rural Development. "We have a critical situation in Buzi," the spokesman, who asked not to be named, told ABC News via telephone Thursday. "If the rainfall increases, then those 100,000 need to be rescued. Levels of the dam are going high." An estimated 1.7 million people were in the cyclone's path in Mozambique, which bore the brunt of the storm, while another 920,000 people in Malawi and "thousands more" in Zimbabwe were also affected, according to World Food Program spokesperson Herve Verhoosel. Now, "the biggest challenge" is reaching stranded residents and others in need, Verhoosel told reporters Tuesday, especially in areas where overflowing rivers have created "inland oceans extending for miles and miles." The storm has been blamed for the deaths of at least 217 people in Mozambique, according to the spokesman for the country's Ministry of Land, Environment and Rural Development -- though Nyusi has warned that as many as 1,000 could be dead. Another 1,440 people were injured, according to Mozambique's National Disasters Management Institute. In Zimbabwe, at least 139 people have died, 144 others were injured, 136 were marooned and 189 were reported missing as of Wednesday, according to a spokesperson for the country's Ministry of Information, Publicity and Broadcasting. 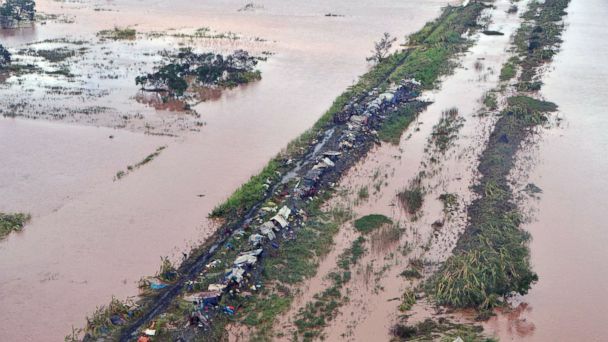 Some 400,000 people were internally displaced by the storm in Mozambique, while an estimated 82,500 were displaced in Malawi, according to the United Nations. More than 4,300 were displaced in Zimbabwe, according to the country's Ministry of Information, Publicity and Broadcasting. The United Nations' Central Emergency Response Fund announced Wednesday it has allocated $20 million to ensure aid reaches those most affected. Jamie LeSueur, who is leading response efforts in Beira for the International Federation of Red Cross and Red Crescent Societies, said while the scale of devastation is still emerging, the situation he's seen on the ground is catastrophic. "This is the worst humanitarian crisis in Mozambique's recent history. It is a humanitarian catastrophe for the people of central Mozambique," LeSueur said in a statement Tuesday. "Large parts of Beira have been damaged, entire villages and towns have been completely flooded. Rescuers are scrambling to pull people trapped on rooftops and in trees to safety. Many, many families have lost everything."